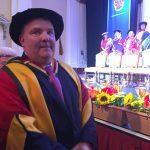 We are proud to announce that Solutions Sales Director Andy Roberts has been presented with an honorary doctorate by the University of Bolton. The award, which has seen Andy becoming a Doctor of Education, recognises his outstanding contribution to local schools, colleges and the university over the past 25 years. Andy is chair of governors at Bolton College which he attended as an engineering student in the 1970s. He is also an independent governor of the University of Bolton and has served on the governing bodies of several schools. In addition he is a trustee of the White Horse Project, a charity which supports young people in gaining life and academic skills and experience. Although he is entitled to use the title of doctor, Dr Roberts said the award hasn’t gone to his head and he will still answer to Andy to colleagues around the office!